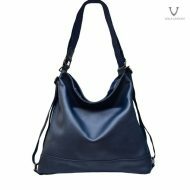 Voila Luccy Leather Hobo-Sling Bag Combination is a Hobo type bag combined with sling bag type, a large sized bag made of supple, flexible, soft, tender, not hard, not stiff premium softy napaa cow leather in four available colors; elegant black, classic brown, candy red, and navy blue. 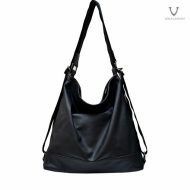 Voila Luccy is a perfect bag for you, classy, elegant, yet casual spirited women on your everyday everyday daily activities. Voila Leather launch a leather hobo-sling bag combination, a modern and simple designed bag handmade by our experienced leather craftsmen using supple, flexible, soft, tender, not hard, not stiff premium nappa cow leather. Voila Luccy large size is perfect to wear on campus, travelling, or for everyday everyday daily activities. Voila Luccy leather backpack-hobo bag combination can be wear over your shoulder (Hobo) and sling it acrros your body (Sling), it has a zippered main chamber opening, completed with one zippered outer pocket, and three inner pockets; two small inner pouches, and one medium zippered inner pocket. 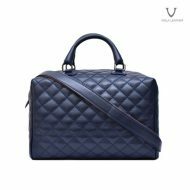 Voila Luccy main chamber is wrapped with soft and smooth velvet suede fabric lining. Voila Luccy Leather Hobo-Sling Bag Combination is a Hobo type bag combined with sling bag type, a large sized bag made of supple, flexible, soft, tender, not hard, not stiff premium softy napaa cow leather in four available colors; elegant black, classic brown, candy red, and navy blue. 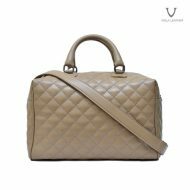 Voila Enyma is a perfect bag for you, classy, elegant, yet casual spirited women on your everyday everyday daily activities.